The right fly fishing line makes all the difference. In spin fishing the weight of the lure being cast pulls the fishing line off the reel. In fly fishing the weight of the fly fishing line being cast carries the fly to the fish. The fly fishing line you cast and the way you cast it creates the “presentation” of the fly. To catch fish you must present your fly in the water column the way the fish expect to see their foods. The right fly fishing line makes that possible. Selecting the right fly fishing line will help you get to where the fish are. Your local fly shop is the best place to get advice on fly fishing lines, especially in choosing the right fishing line for your fishing needs. Nothing “sinks” a fishing trip faster than arriving with the wrong fly fishing lines for the fishing situations. Shape and construction: These determine how the fishing line delivers the fly. 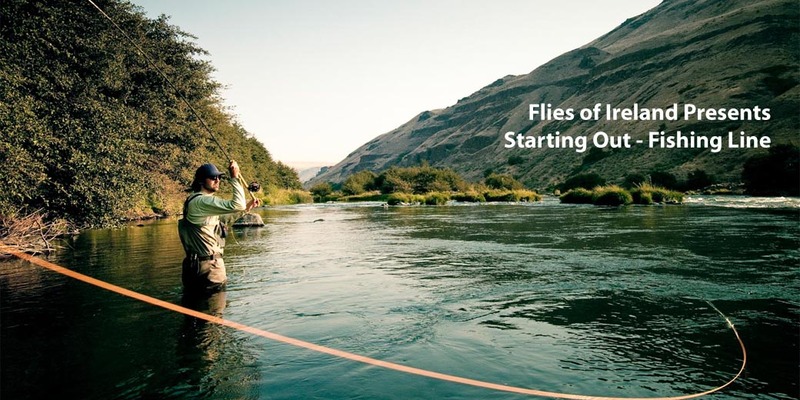 In fly fishing you want to deliver the fly where and how the fish expect to see their food. So, you must choose the fly fishing line that is designed with the proper length, weight, taper, color, specific gravity and coating for the fishing you want to do. Length and Weight: A fly fishing line’s weight is distributed throughout its length – from 90 to 105 feet or more – but its weight designation (1- through 15-weight) is determined by the weight of the front 30 feet of the fly fishing line. Fly line weights range from a 1-weight to a 15-weight. Tapers: The way fly fishing lines shoot, turn over a heavy fly, present a small fly delicately, or cast efficiently at long or short distances is through the taper design. The fly line’s taper (its outside dimension) is designed by varying the thickness of the fishing line coating. Notice the way a fly line is described – tip, front taper, belly, rear taper, head and running fishing line. All these elements can be varied to change the casting performance of the fishing line. Fly lines are broken into five design categories: the seldom-used level (L), the highly popular weight-forward (WF), double-taper (DT), shooting-taper (ST), and specialty tapers. The fly lines you will use the most are weight-forward, double-taper and specialty. Color: Some fishermen prefer a brightly colored fly line so they can see where their fishing line is in the air and on the water. It helps them in casting and in knowing where their fly is at all times. Others prefer fly lines that blend in with whatever background they are fishing. Fish see colors, they reason, so why spook them with colors they are not used to seeing? You must decide what color fly line works best for you. Coating: Fly lines float because they are designed by the manufacturer with tiny air bubbles in the fishing line surface. If instead the manufacturer adds lead or tungsten to the fly line’s coating, the fishing line will sink. Fly lines are constructed of a core, a taper design, and a coating (usually polyvinylchloride). These basic elements are varied to make form follow function. In other words, by changing the core, coating or tapers, the manufacturer can make fly lines that perform best under any fishing situation. Since more than 90 percent of a fish’s feeding occurs beneath the surface, you need fly lines that get your fly down, sometimes slowly and at other times very fast. Full-sinking fly lines are best suited to fishing in still waters. They are designed to get flies down to the level where the fish are feeding. So you need to match the sink rate of the fly line to the fishing conditions. Fly lines that sink uniformly (evenly) or head first are the best fishing lines to use for fishing still waters (lakes and ponds), because they provide better strike detection. Some sinking fly lines tend to belly in the middle because they do not sink uniformly. The belly creates a sensory disconnect between the fisherman and the fish, so the fisherman fails to detect the strikes before the fish can reject the fly. The uniform-sinking fly lines provide a straight-line connection to the fly, allowing you to detect a high percentage of strikes and catch more fish. Sinking-tips are sinking portions of fly line (usually 8 to 15 feet) connected to the front of floating lines. They are excellent for shallow and deep nymphing, for mending fly line to create a drag-free float, and for turning over and sinking very large streamers in river-bank and pool fishing. For the best advice and choices, buy your fly lines at a fly shop where you can describe your fishing needs and receive the counsel of experienced fishermen. The weight of your fly line must match your rod – 6-weight lines for 6-weight rods and so forth. The larger the fly, the larger the fly line (and fly rod) needed to cast it. Fishing the water column from top to bottom requires both floating and sinking fly lines. As water depth and flow increase, the heavier the sinking fly lines you will need to penetrate it. If you cannot penetrate it to where the fish lie (near bottom), you cannot present the fly in the level at which they are feeding, and you will not catch them. Match the type of the fly line to the fishing conditions for which it is designed. Take care of your fly line, and it will take care of you. If you see a line marked “Trout,” “Bass,” “Bonefish,” “Big Game” or the like, you know that it is designed for that species. Fly line designations are indicated on the side of the manufacturer’s packages as in these examples: “WF8F” means weight-forward, 8-weight, floating; or “Wet Tip V 13′” means sinking-tip, very fast sinking, 13-foot tip). Then the length of the fly line is given: 90ft./30 yd./27.4m. Each tells you something important about the function of the fly line. Fly fishing lines should be washed in mild soap and water and wiped dry or cleaned with a line cleaner after use, because they accumulate dirt and algae on their surface, making casting difficult and floating fly lines sink. After cleaning, allow the fly line to dry in the shade (ultraviolet light from the sun destroys the chemicals in a line), or wipe the fly line dry and dress it with lubricant provided by the manufacturer or with Armor-All. Some newer fly lines require less dressing because they have lubricants in the line coating that gradually weep toward the surface. When you are not fishing the fly line, detach the fly and wind the line onto the reel until your next trip. Long storage on a reel can create reel-coils in the fly line, but to remove the coils you just need to stretch or cast the line. At the end of the season clean your fly lines thoroughly and wind them back onto their original line spools. Always keep your fly lines stored out of direct sunlight. The sun’s ultraviolet rays and high heat (a hot car trunk, for example) can cause the coating chemicals on the fly line to deteriorate quickly. With proper care your fly lines should last from three to five years under normal use.